Within CellSmart POS Bill Payments can have a different status depending on how the payment was made. This can affect where a payment will show or from where it can be refunded or deleted. Payments made from the Payment module will be placed on the list of its provider. For example, let's assume 212-222-222 is a T-Mobile number and the payment has been processed under Provider A. From here the payment can either be added to a running invoice on the register or you can proceed to check out to receive tender. If you have already processed the payment through Provider A, then you may enter the Payment ID. After check out, you will see an invoice for the sale within the Transaction List and you will see the bill payment within Provider A List. A payment with a Payment ID will be placed in Done Payment and a payment without a Payment ID will be placed in Pending Payment. From within the Pending Payment List you can delete a payment, mark it done by entering and saving a Payment ID, or can place the payment on hold. Done payments can only be moved back to Pending Payments. So in order to delete a payment, one would have to first mark it pending and then delete the payment. The provider payment list is completely separated from the Invoice that hold the tender information. Deleting a payment from the provider list will not refund the customers tender and refunding an invoice from the transactions list will not delete the payment entry made in the provider. If a payment under a customer's account was voided on the Provider side and the customer will receive a refund from the store, then the user has to delete the payment from the bill payment list and then proceed to refund the customer through the transaction list. Payments that are made from the register or added to an invoice from the payment module have an extra step. After checkout, CellSmart POS will place the bill payment within a pending invoice list. You can view this list by pressing this icon at the bottom left corner of the main window. This is done in order to get more information from the user before the payment is placed within the bill payment list. In order to successfully save a pending invoice, the provider, carrier, phone number, and payment id will need to be present. 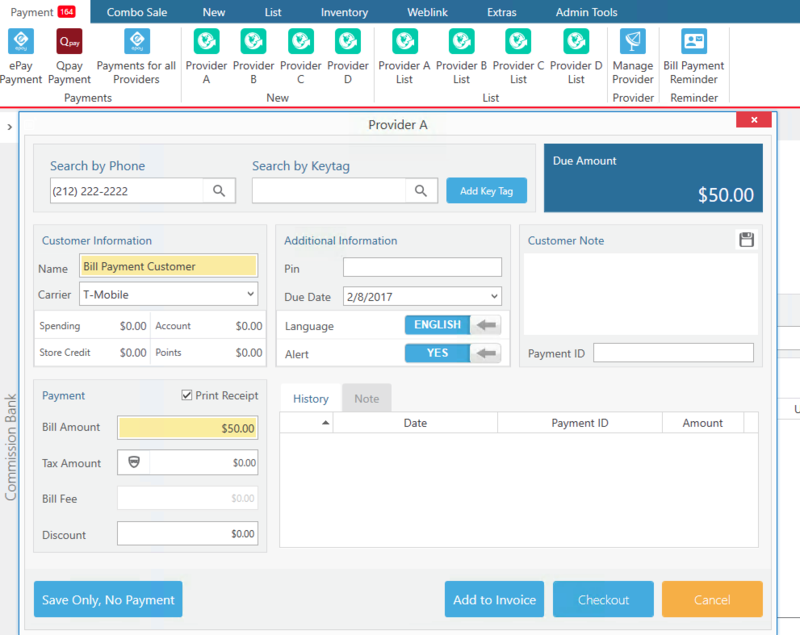 Once the invoice is saved, the bill payment will be placed under the Done Payments tab for the chosen provider and will be treated as a regular bill payment made from the Payment module.